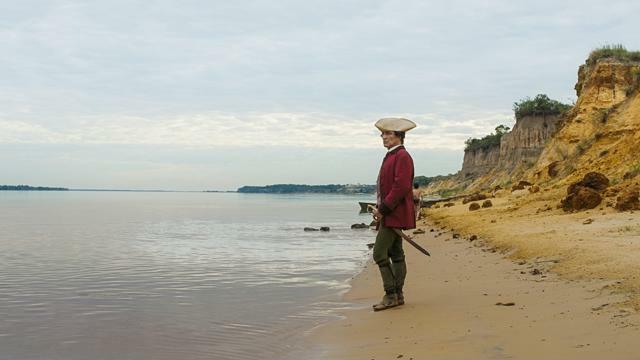 DT: I normally view books and films as totally independent entities, but I had a different experience with Zama. The book and the film are totally separate, but you and Di Benedetto seemed to me like a daughter and father working together on the family farm, side by side. Perhaps the daughter will plant a different crop, but she and her father are still tilling the same land. That being said, how did you translate the book into the film? More specifically, what was the conceptual process of imagining the film? LM: The truth is, I probably would have said something different before making this film. When we talk about film and literature, we think about two completely separate entities. We see literature as impressionable characters and cinema as sound and images, but I learned through this process that there’s something very similar between the reader of literature and the screenwriter. When you read a novel, you’re submitted into a rhythm and an intensity that’s very similar to when you’re writing a screenplay. For me the distance is not that great, because basically what’s needed is a reader who gets affected by the text. It’s basically the same process. DT: One of the outstanding features of the book was its “enigmatic temporality”—a phrase from Esther Allen, who translated Zama into English. How did you deal with the challenge of portraying ambiguous time in a medium that’s constantly in the present? LM: That’s another myth about period films, because ultimately what is the time of the film? The book was written in 1957 and tells the story of the end of the 18th century, and it’s shot in the first decade of the 2000s. So what is the time of the film? I think it’s ultimately a mistake to think of the time of the film as one that’s set in the storyline. I experienced this as well. I think the period piece is inevitably a film about the present. And there’s another idea, that the storyline gets confused with the film; the film is minimized to its plot and the time of the plot of the storyline. DT: For Zama the character, time is interwoven with identity and place. Is that typical of Zama’s class? LM: What the film narrates is an intimate drama of any bourgeoisie in Latin America, particularly today, particularly in Argentina. 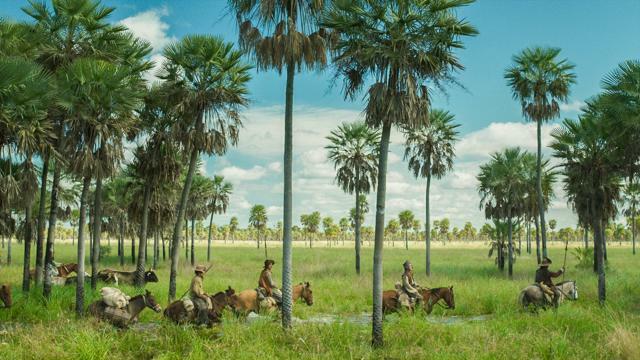 The drama of Zama is the drama of any petit bourgeois in Latin America. The impossibility of being in a place, being in internal transit. DT: And what about identity? LM: In terms of identity what interested me most about the novel is what one is forced to be by being someone. What we consider positive in terms of identity I see as something negative, actually. Being someone is actually a restriction of freedom. I thought the Internet would allow for that, for identity to thrive, but I think it was the opposite, it was a failure. DT: The third challenge I saw with making the book into a film was dealing with Zama’s alternating hallucinations and sense of reality. As a filmmaker, what elements of the medium did you use to distinguish between his illusions and reality? LM: For me that’s why the work with sound requires so much care, so much attention. The sound is what allows for the audience to be submerged in this state and not trust the images; it allows for the audience to see beyond the images. This sound immersion becomes very particular in allowing the viewer to see beyond the images by not confirming what you’re seeing with the images but taking a step forward. It demands a very specific type of work. In cinema, Foley basically re-creates the sounds of what’s seen, but sadly most of what is done in sound design is done as Foley; sound designers make the sound of what’s being seen just to underline the images but not to create something different. DT: Do you think that aspect of sound functions because sound works more unconsciously? People think about the images they see, but they have an unconscious or subconscious perception of the sound? LM: I think there can only be unconscious perception of sound if sound does not reference what you see on screen. It’s a tough balancing act because you have to give audiences enough clues not to make it look like delirium but also enough things for them to not reference what’s onscreen. Sound is more savage, it’s less domesticated. Usually sound just makes a re-formation of the images. I think romantic comedies are the lowest genre because very few times they question reality, if ever. DT: Di Benedetto wrote two screenplays. Did you watch the films or read the screenplays? DT: In many ways, the film, like the book, is about nothingness. Nevertheless, it was completely gripping. How do you dissect nothingness to make something thrilling? LM: I think the great malady of our time is believing entirely in plot, in storyline. Make believe that the storyline is everything, that the plot is everything. For me, identifying the plot with the film is exactly like not understanding the difference between a house and a home. One is the skeleton, the structure, but what gives content is something different, something completely else. So knowing that difference, that the film is not the plot itself, is key. People think it’s very difficult to make this kind of film, but it’s actually not more difficult or easier, it’s just a different system of beliefs, a different notion of time, a different notion of cause and effect. With a timeline where there’s the future, the past, and the beginning, you have a construction that is so elementary it doesn’t allow us to talk about emotions. DT: When I said nothing, I meant it in an existential sense. LM: I understand the perception of nothingness, but I see the film as full of emotional moments. I don’t see the nothingness, I don’t think it actually exists. We’re just used to being taken by the hand everywhere—by the nose in this case. It’s like an amusement park, but in this particular case we arrived at the amusement park and the lights are out, so where are we heading? DT: That’s a great image. You changed certain details in the book. For instance, at the end of the film, Zama is rescued by the Indian, not the blond boy. How did you decide which details to change, which to keep, which to throw away? LM: The first things I took out were the dreams and the symbolic elements—for example, the blond kid. I used different kids, not one blond kid. Something I decided to keep was his attention to his desire, which he can’t complete, can’t accomplish. Another important thing I kept was identity, particularly with Vicuna Porto; that he embodies evilness. For any government it’s easier that someone embodies evilness because that avoids critical thinking, it’s an easy way out. In this country it’s very obvious, Trump is always creating enemies, Iranians and Koreans, creating this enemy as a way to avoid people. DT: I thought the film was a tremendous translation of the book, but you even went one step further. You crystallized the essence of the book with Vicuna Porto. He’s this weird character—he’s like Puck, sometimes really evil, sometimes kind of funny—but there’s this moment where he’s completely honest and says to Zama, “You know where the cocos are, right?” It was as if all of the pretense and false identity and everything else fall away even though they are actually embodied in that moment, which wasn’t in the book. Was that intentional on your part? LM: For me it was very important, toward the end, that it’s just an absurd preoccupation, someone who fervently believes in something that ultimately is absurd. I think that existential experience actually happens to all of us, that we’re always blind about something absurd, and moments like illness or the death of someone close makes us question why we have worked so hard to achieve so little, so it’s incredible that we can keep our lives going like this. Because it’s everyday life it’s hard to grasp those moments of questioning. Vicuna Porto makes precisely that point at the end: he’s worrying about the coconuts. When I read the novel, I had this euphoria that I understood something about existence that I don’t know how to explain, but it was a moment of great happiness, with no reason or explanation. So years later, this is what I brought: this sense of euphoria. DT: When Matheus Nachtergaele, who played Vicuna Porto, asked that question about the coconuts, did you as a filmmaker have a feeling of “Oh my God, I got it”? LM: It’s very difficult to have that certainty when you’re in the middle of shooting, because those moments can be misleading. However, when Matheus was acting I knew we were going in the right direction. He’s a great actor. He looks a little bit like Jack Nicholson. Thank you for reading this wonderful book. DT: It’s one of my favorites. Thank you for making this wonderful film. 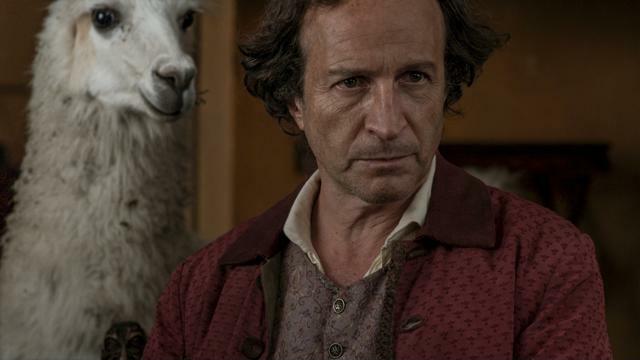 Tagged Antonio Di Benedetto, Argentinean cinema, existentialism, Lucrecia Martel, Zama. Bookmark the permalink.